MANILA, Philippines - State weather bureau PAGASA has released latest bulletin on 'Bagyong Egay' (international name Linfa). On its 11:00pm update on Friday, July 3, 2015, tropical storm has intensified further as it continues to move towards the Northern Luzon. 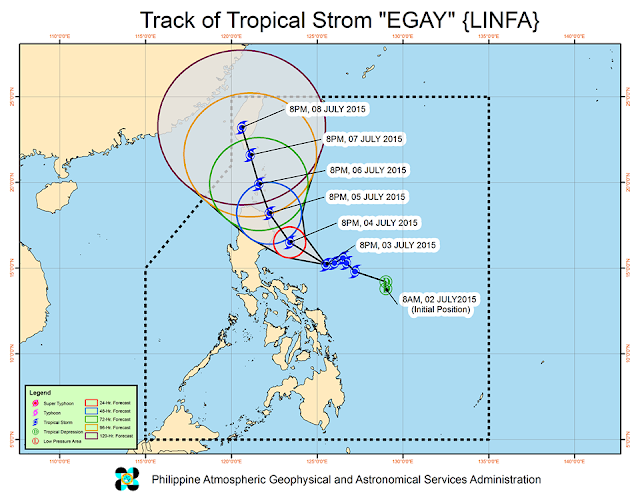 At 10:00 PM today, the center of 'Bagyong Egay' was estimated based on all available data at 395 km East of Baler, Aurora (15.2°N, 125.2°E). It has maximum sustained winds of 85 kph near the center, gustiness of up to 100 kp and forecast to move West Northwest at 10 kph. 24 hour (Tomorrow evening, July 4): 140 km East Northeast of Casiguran, Auora. 48 hour (Sunday evening): 60 km East Southeast of Aparri, Cagayan. 72 hour (Monday evening): 170 km North of Aparri, Cagayan. 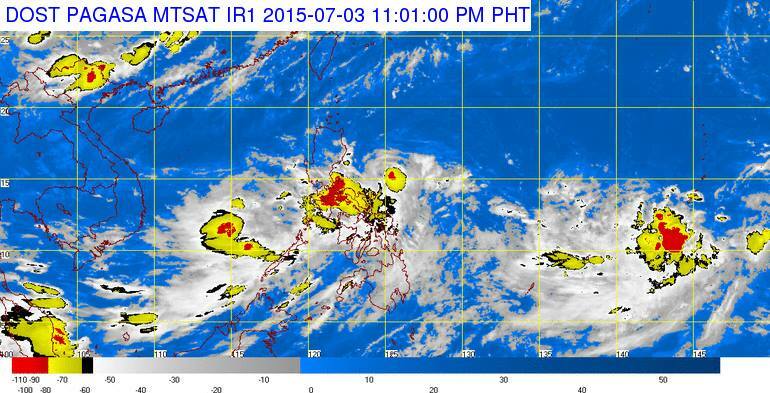 96 hour (Tuesday evening): 155 km Northwest of Basco, Batanes. PAGASA said that the estimated rainfall amount is from moderate to occasionally heavy within the 400 km diameter of the tropical storm. The fisher folk and small sea crafts are advised not to venture out over the eastern seaboard of Central Luzon, seaboards of Southern Luzon and Visayas and the northern seaboard of Mindanao. Residents in low lying and mountainous areas Metro Manila, CALABARZON and Bicol Region are alerted against possible flashfloods and landslides.